For those who like Japanese street food, this is one of them. Takoyaki. It is essentially a light ball of dough with vegetables and octopus in it. I have had it 3 times in my life, including this picture shot. I knew I was watching a show on youtube about Japanese street food that’s why I ended up hankering for it. But my first experience of this was bad, the second one was good. So I barely have had enough experience to actually want to try it again. But I wanted to. So there we were at the mall, and I always see that kiosk making those balls, and there they were. There was a lot of people in line and I took that as a good sign. The person though put the sauce on immediately, plus the mayo. And from experience, I don’t like sauces that much. And for this one, I didn’t like it. I ended up eating 1 piece and gave my mom two left. And she wasn’t a big fan either. 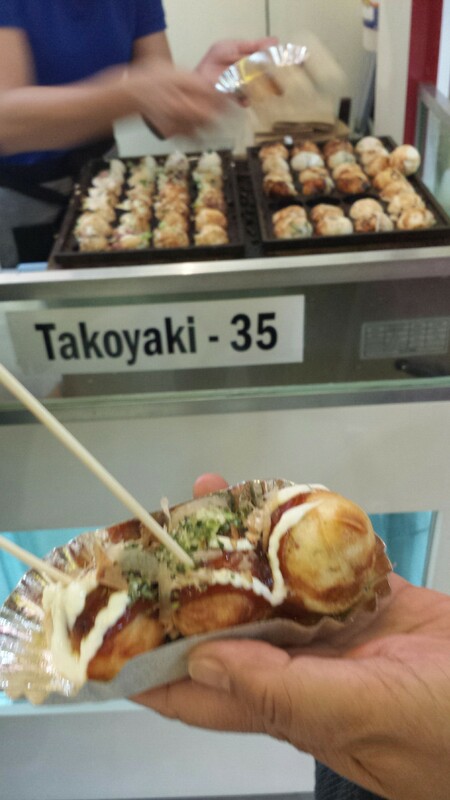 I am off to hunt for more takoyaki dishes, and hopefully, one will pass my preference.